The Great Outdoors is right on our Doorstep, it would be a shame not to appreciate it. 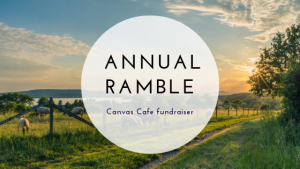 This year we decided to make the most of the post-Christmas, pre-new year lull, and turned our hands to hosting an organised ramble in aid of raising money for Jubilee Foodbank. 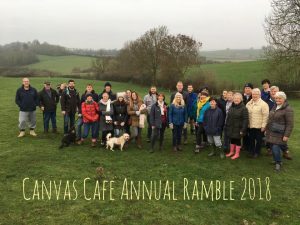 The group met at our Canvas Café before heading out to embrace the great outdoors, we took a ramble through the surrounding countryside, before meeting back at the café for a bowl of soup and a bread roll. We are always championing getting outside and enjoying nature, but between the Christmas movies on TV, and the never ending stream of online shopping offers the festive period can become somewhat saturated with technology, with a little too much time indoors. So we thought…what could be a better way to end the year than offering the opportunity to gather up friends and family, get a little bit active, embrace the beautiful countryside that surrounds us and connect with nature. Plus, we get the opportunity to get in the kitchen and provide people with nutritious, local, organic food, which as you know, we just love doing! 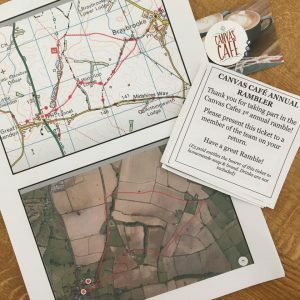 So, we dug our walking boots out from underneath a pile of disused Christmas wrapping paper, wrapped ourselves up in our cold weather walking necessities and gathered everyone together at the Canvas Café on the 27thDecember. We set off with our group of eager ramblers and led them around a beautiful 7km loop through the fields behind our yurts. We were blessed with some clear, mild weather and were thrilled to see such a great turn out, with so many of you lapping up the fresh country air after a little overindulgence on Christmas Day. We’re not sure who enjoyed it more, the muddy pups running unhampered around the fields, or us. And of course, there is only one thing that should follow a long, crisp country walk…a hot soup and a warm drink! All of our ramblers returned to the café with a little mud on their boots, a little colour on their cheeks and a smile on their faces. And we had a steaming pot of roasted sweet potato and red pepper soup ready for all of the tired walkers, perfect with a buttery roll! But, the ramble wasn’t just because we love a good walk and a good meal, it was all in aid of raising money for a wonderful local charity. The profits from the Annual Ramble went to Jubilee Foodbank, an organisation that we are very proud to support. A representative from Jubilee Foodbank was able to attend on the day to help spread the word of the work they are doing and how everyone can help. They work towards providing food to those in need, more information can be found on their website. Did you know that the air is actually cleaner in winter as the high ozone levels so common in the spring and summer months have passed? Meaning, those deep cleansing breaths of fresh air, are indeed, very fresh. Not only that but winter walking will increase your energy levels, help you sleep better and even help your brain work better! So make sure you get yourself outside and enjoy the great outdoors for that much needed Vitamin D fix during the winter months. Follow our Facebook page to keep up to date with any events like this in the future.